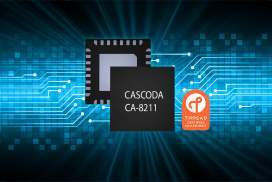 Cascoda announces the CA-8211: a Thread certified IEEE 802.15.4 modem device, featuring SMARTRange™ technology for long range communications, and an embedded MAC for simple integration with any Linux, RTOS, or bare-metal MCU platforms. In 2015, the UK Office of Communications (Ofcom) concluded that 2.4GHz IoT technology adequately covered only 36% of UK houses. The reason for this is that transmission power is limited to just 10mW in the European Union, and many other major markets. Therefore the only solution to this problem is to increase receive sensitivity. Previous receiver architectures have limitations on their efficiency so the only way to overcome this problem was to invent a new, more efficient, radio architecture. Overcoming the limitations of existing receiver architectures is a problem which radio designers had failed to solve in recent decades. “Cascoda set out to solve the problem of receiver efficiency for IoT devices, as we could see that the world had become used to the range of WiFi, which can transmit at up to 100mW, while 2.4GHz IoT technology can only transmit at 10mW,” says Cascoda CEO, Bruno Johnson. SMARTRange™ dramatically improves the efficiency over previous designs. The power which SMARTRange™ products save allows us to put more power into the receiver circuits, thus lowering noise generated and delivering a receiver with much improved receive sensitivity and range. SMARTRange™ products feature a best-in-class -105dBm receive sensitivity, vastly improving the available link budget and thus the achievable range for reliable communication. “I devoted six months of my life to researching the receiver efficiency problem. During this period, I did nothing else but study, model and test, until I discovered a new type of mathematical transform, never previously applied in radio receivers, to deliver both excellent receiver noise tolerance and low power consumption,” says Cascoda CTO, Wolfgang Bruchner. The CA-8211 SMARTRange™ device is a fully-featured Thread certified transceiver modem solution for IEEE 802.15.4 communications in the 2.4GHz band. PHY and MAC support functions and system configuration are handled by an intelligent co-processor, thereby minimizing the control overhead for the system host. Unlike PHY-only devices, the CA-8211 API interface is insensitive to the timing of commands on the SPI bus. The CA-8211 can therefore be controlled directly from Linux, or your existing MCU, allowing you to concentrate on your application, without the need to worry about PHY or MAC standards compliance. Thread is a low-power wireless mesh networking protocol, based on the universally-supported Internet Protocol (IP), and built using open and proven standards. Thread enables device-to-device and device-to-cloud communications. It reliably connects hundreds (or thousands) of products and includes mandatory security features. Thread networks have no single point of failure, can self-heal and reconfigure when a device is added or removed, and are simple to setup and use. Thread networks are highly interoperable between vendors, and all Thread devices will remain compatible with future versions. This promise gives developers the confidence that their product will be able to reliably connect to the internet for years to come. The Thread Certification program is the rigorous testing process which ensures those values are upheld, and Cascoda’s compliance is assured with the certification of the CA-8211.